To the south of Genabackis and to the east of Korelri lies a landmass whose very name is rarely uttered. “Assail” is the most mysterious, the most enigmatic and the most foreboding of the world’s continents. It is not a remote continent, lying just a few weeks’ travel eastwards from Quon Tali across the Reacher’s Ocean and just a few days south of Genabackis across the Rivan Sea, but it is one that is studiously avoided by almost everyone. The continent of Assail. Click for a larger version. Little is known of Assail’s ancient history. The continent has a human population, so at one time the continent was likely settled by the First Empire (which is generally held to be responsible for the initial human diaspora across the planet), but beyond that the continent is also known to have pockets of Jaghut blood. It is believed that both the highly mysterious Forkrul Assail (who may have given the continent its name) and the K’Chain Che’Malle were also active on the continent in distant, past millennia. In recent times, the continent has been effectively sealed off to travel. Almost all who travel there, particularly to the lands north of the Black Stone Mountains, fail to return. Rumours speak of Tyrants who control parts of the continent and the destruction of entire clans of the T’lan Imass. Rumours also speak of gold being found on the continent in significant quantities. Occasionally this sparks gold rushes, pirate fleets and mercenaries setting out to get rich. Again, almost none return. Assail is a fairly large continent, more than two-thirds the size of Genabackis and larger than Quon Tali, perhaps rivalling the combined Korelri-Stratem continent in size (but still somewhat behind Lether and Seven Cities). Various sailors have attempted to chart its shores, with some success, although the inhospitable nature of those shores makes such attempts difficult. It is known that the continent is divided into two distinct regions by the Black Stone Mountains. Everything to the north is Assail proper, a land of townships, city-states and fractious tribes. The lands to the south are known as Bael, which forms a distinct subcontinent. Bael is relatively hospitable and sometimes welcomes outsiders; Assail is unrelentingly hostile to visitors. The northern coast of Assail sits south of Genabackis, just across the Rivan Sea, and is relatively accessible. However, the entire coast is uninhabited. From the Barren Coast in the west, stretching hundreds upon hundreds of leagues to the east, along the Plain of Ghosts, Plain of Visions, Plain of Sighs and the Wrack Coast, lies almost nothing. Barely any trees, no mountains and few sources of fresh water can be found. This is a lifeless and dreary land. According to rumour, one settlement can be found on the north coast, a hidden inlet or bay leading to a fortress called Fallen or Taken. If true, no reliable sailor has ever confirmed its location. The western coast of Assail brushes against both Reacher’s Ocean and the Bloodmare Ocean, with the continent of Korelri located just a couple of weeks’ hard sail to the west. Again, the coast is mostly uninhabited, although nomadic tribes (of course, mostly unwelcoming and hostile) can be found just inland on the plains between the ocean and the Range of the Saints. In the south of this region can be found the Yag’Quarall, the Silent Tribes. Curiously, the sailors of Mare in Korelri, despite claiming to be the greatest sailors in the world, refuse to cross the ocean to Assail, refusing to believe lands lie beyond the ocean. The east coast of Assail is where what civilisation that is vaguely welcoming to foreigners can be found, although this is a very relative determination. Once a ship turns south along the Plain of Longing, it enters the Sea of Hate, so-called because of the dangerously lethal currents and hidden rocks. If they survive to the enter the Bay of Timber, named for the once-abundant forests on its shores, they can find a relatively safe welcome at the port of Holly. From here, they can travel north across the Plain of Chance, in the shadow of the northern Bone Range, to the City of Many Saints on the shores of the inland Sea of Gold. Naturally, few who venture in that direction are ever seen again. The south coast of the Bay of Timber and all the east coast as far as Talon Forest are known as the “Wrecker’s Coast”. Currents conspire to bring many wrecked ships to this stretch of water, resulting in wrecks and ruins from half the world accumulating along the shores. The people of this land are known as wreckers, as looting the ships for gold, weapons and booty to sell on to traders is highly lucrative. Towns along the coast, such as Rough Landing, Bones, Pillar and Widden, are wrecking posts from where crews set out to loot the ships brought to them by the ocean. Halfway along the Wrecker’s Coast is a bay that leads to an inlet. This stretch of water – the Fear Narrows – is lethal and almost impassable due to the Guardian Rocks. These pillars of stone swirl the water into unpredictable currents that can smash boats to kindling with ease, whilst more rocks lie just under the water, ready to tear out the hulls of any ships that try to pass. Wrecked ships can be found all along the shore, adding to the chaos, and the coastlines are marked by tall cliffs. If a ship should successfully run the gauntlet of the Fear Narrows, it might find shelter in the port of Old Ruse, although as many ships vanish after visiting Old Ruse as they do attempting to pass the Narrows. Beyond Old Ruse the Narrows open into the Sea of Dread, a large inland sea. Formed of meltwater from what some mages theorise may be a Jaghut-created glacier, the sea is inherently magical. Unprotected sailors can fall into a torpor that eventually leads to death. Mages aware of this threat can erect defensive wards around their ships which permit safe passage across sea. There are settlements on the Dread Sea. Second Landing and North are relatively ordinary, if somewhat isolated, ports. On the south coast is Exile Keep, run by two families involved in constantly feuding against one another. To the north is Mist, reportedly ruled by a powerful and capricious mage. Further north lies the Sea of Gold, so called because it lies at the feet of the Blood and Salt ranges, reportedly the home of vast gold fields. The truth of this is hard to ascertain, as both the sea route through the Dread Sea and the overland route over the Plain of Chance from Holly are extremely hostile, and of the few who survive the journey far fewer (if any) ever successfully return). 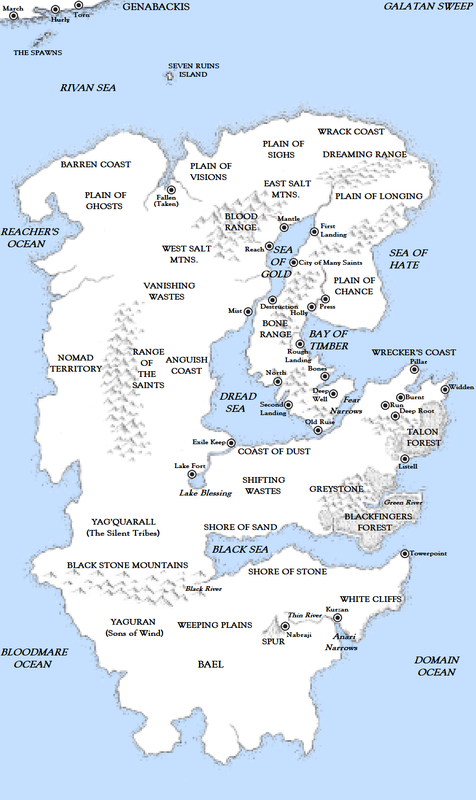 Located at the southern end of the Assail continent, the lands of Bael are relatively welcoming compared to those of the rest of the continent. Bael is effectively separated from Assail proper by the Black Sea to the north-east and the large Black Stone Mountains to the north-west. Bael is the home of a collection of tribesfolk who worship a deity known as Father Wind. Some of the inhabitants of Bael have abandoned their tribal lifestyle to found cities, such as Nabraji and Kurzan. Kurzan is the southern and eastern-most known safe port in the world; beyond it lies the vast and trackless deeps of the Domain Ocean which extend eastwards for thousands upon thousands of leagues before reaching the far western coast of the continent of Lether. The tribes of Bael are known as the Yaguran or People of the Wind. They worship shamanic totem spirits as well as Father Wind, and engage in athletic competition and “friendly” raids on one another as demonstrations of aptitude. They are relatively friendly, but in recent decades have found their lands encroached on by the Nabrajans, who have started building garrisons on the plains to control sources of food and water A major conflict between the tribes and the city-builders seems likely. Unlike northern Assail, Bael is relatively easily reached by ship across the southern Bloodmare Ocean from the east coast of Stratem.